Photo: Smith-Giltinan House, ca. 1888, 1223 Virginia Street East, Charleston, WV. 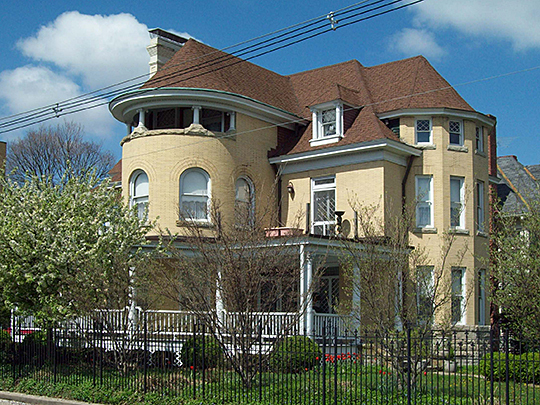 Listed on the National Register of Historic Places in 2002. Photographed by User:Pubdog (own work), 2009, via Wikimedia Commons, accessed February, 2013. The Kanawha County Courthouse is located at 407 Virginia Street East, Charlestown WV 25301; phone: 304-357-0100. The county was created in 1789 from parts of Greenbrier and the former Montgomery Counties. The Kanawha (variously spelled Conoys, Conois) were a tribe of native Americans who once occupied the area. The county once spread over one-third of the state; over the years land was lopped off to form 19 other counties, in whole or in part. In 2000 Kanawha County had more than 10% of the population of West Virginia. Federal government projections predicted that share would fall to 6% by 2010. Kanawha County was formed by an act of the General Assembly of Virginia, effective October 1, 1789, from Greenbrier and Montgomery Counties. The new county covered an area of approximately 2,092 square miles, but did not have a courthouse in the county seat at Charlestown (Charleston). All necessary court proceedings were held in the home of William Clendennin at Fort Lee, site of the settlement of Charleston, until 1796. In that year the county acquired for George Alderson a lot where the first courthouse, a one-story log building, was erected. It served until 1817 when a brick, two-story edifice, 50 feet square, was built. This building was inadequate with the expansion of Charleston in the late 19th century and was torn down in two days time beginning on April 7, 1888. County Commission President John S. Cunningham, and Commissioners W. S. Laidley and C.S. Young selected the plans of the Richmond, Virginia architectural firm of Shieff and Highnam for the new courthouse. The building was erected in 1892, at a cost of $153,000, in the Richardsonian Romanesque style and stood unaltered until 1917 when the Kanawha Street (Blvd.) addition was erected. Collins, Rodney S., West Virginia Department of Culture and History, Kanawha County Court House, nomination document, 1978, National Park Service, National Register of Historic Places, Washington, D.C.